A site for wildflowers and mushrooms. Grizzly Peak, a spot named for the last known grizzly bear in Oregon, is nothing short of amazing. 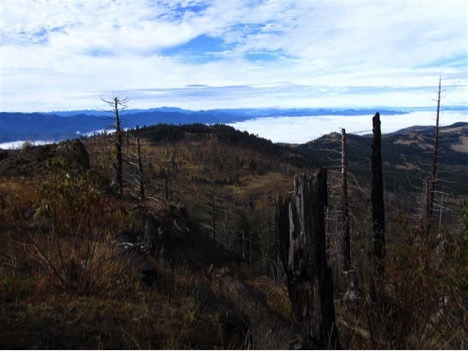 The peak sits at an elevation of 5,922 feet, offering a view of the Rogue Valley and the city of Ashland. 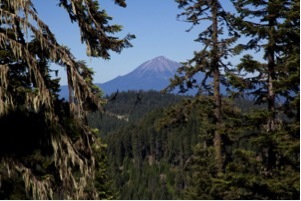 There are also amazing views of the Cascades, including Diamond Peak, Mt McLoughlin, and Mt. Shasta in California. Be sure to do the entire loop, otherwise you may risk missing some of these incredible views! The hike itself is only 5.4 miles, but offers a variety of incredible views. The trail leads you through a forest of Douglas fir, grand fir, and other true firs, as well as a few cedars. 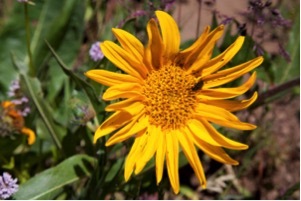 At two different peaks in early June and then in July, wildflowers put on a spectacular show along different forested or open portions of the trail. The most botanically diverse part is along the area’s west side rocky outcrops that come into bloom in late May and peak by early June. Flowers in the more shaded/forested and wet areas come into bloom in late June and peak in July. When hiking in late spring, the start of the trail may be packed with people picking morel and chanterelle mushrooms, but keep on hiking and you will soon escape this frenzy of people. Be sure to keep an eye out for elk and deer, as well as many other animals including Golden Eagles and other birds of prey. In 2002, the East Antelope fire swept through this area and caused a lot of damage. Although the area has recovered well from this fire so far, it is still important to protect it and try to avoid any further incidents. Sign the Crater Lake Wilderness petition to help ensure that this site for wildflowers is kept safe for years to come!